Success! Garmin have updated their Google Play app with the connectivity Android smartphone users have been waiting for. You can now upload your fitness activity wirelessly to Garmin Connect over a Bluetooth Connection. iPad and iPhone users have had this luxury since the launch of Garmin FR 220 and 620 watches in 2013; the two running watches currently compatible with wireless transfer. As an LG Nexus 4 smartphone user, here’s a guide on how I connected my Android phone to my Garmin Forerunner 220. Before we start, it’s essential that the Android smartphone you’re trying to connect with your Garmin has Bluetooth 4.0 connectivity. The fourth iteration of Bluetooth is known as Smart Ready and allows accessories like your GPS watch, to communicate with apps, such as Garmin Connect. Here’s a list of popular phones that have Bluetooth 4.0 compatibility. As a rule of thumb, most mid to high tier smartphones released after Jan 2012, should have the ability to wirelessly connect to your Garmin FR 220 or 620 watch. You can search for detailed specs of your mobile phone at GSMarena. What if my phone doesn’t have Bluetooth 4.0? Unfortunately this means you will be unable to pair up your smartphone with the Garmin 220 and 620 watches. After you’ve unlocked the watch, press the down arrow to enter the menu. From here, navigate through these settings below. Swiping down from the top of the screen on your Android phone should open up control panel features. The exact look of this will vary depending on how your manufacturer has skinned the Android user interface. With my Nexus 4, I can switch access the Bluetooth menu by clicking on the logo in the top right of my drop down menu. 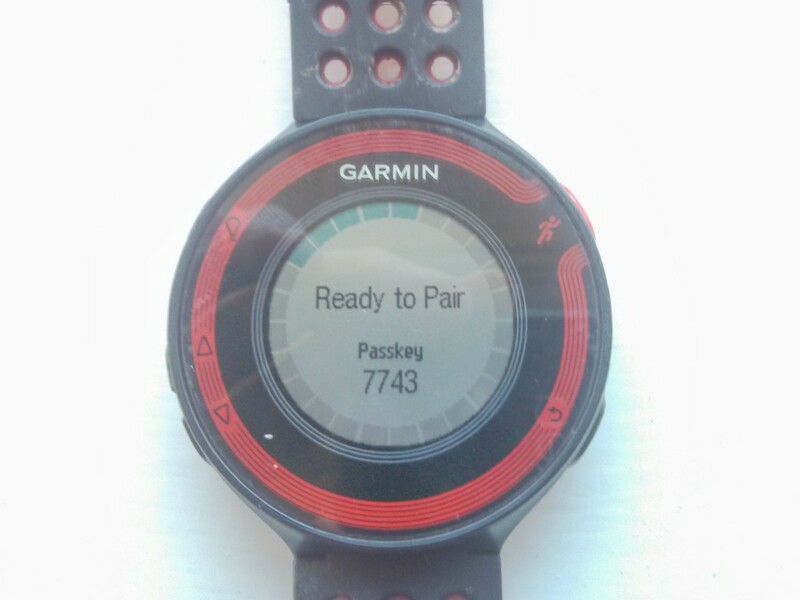 Step 4 – Pair up phone with Garmin. Open up Garmin Connect and touch home to choose the “Devices” category. Once you press start on your phone, both devices should display a four digit number to confirm the sync. Provided these match, confirm on your phone and wait for the data to collect. Once paired up, the Device menu on Garmin Connect should show a picture of your Garmin model with green text that reads “connected”. If you click on settings, this will give you the option to auto upload activity from your watch to Garmin Connect. Go for a run and try it when you get back? Provided your Bluetooth and Garmin Connect is loaded up, your Android smartphone should pick up your activity. What I love about this feature is that the process of uploading your activity is much more seamless. There’s no need to switch on my laptop and connect my FR220 via USB. By placing the watch within 10 feet of my Android device, the activity transfers across over Bluetooth. How long does it take to transfer a run to Garmin Connect? When I first tried to upload my runs, the progress bar froze and I got bored of waiting after 30 minutes (not a promising start!). To overcome this, I uploaded all data via my computer first and then went for a run so only a single file needed to be uploaded. The Garmin can usually transfer a run over Bluetooth in under 2 minutes. It’s important to ensure that your Forerunner doesn’t go into power save mode. Press a button to stop this if you see the count down. Unfortunately this has happened to me a few times even when the watch is sat on top of my Nexus! My solution was to go on the device menu and add a new device. Once it finds the Garmin, it should open up a slightly different looking progress bar and upload activity. So there’s my guide on how to enable wireless data transfer from your Garmin GPS watch to an Android mobile phone. At the time of writing, this is the process for the Garmin Forerunner 220 and Garmin Forerunner 620. The stages within Garmin Connect also apply to cycling GPS watches such as the Edge 510 and Edge 810, though Bluetooth menu functionality will differ on the watch itself. This article states that the Sony Xperia Z has Bluetooth 4.0 compatibility. 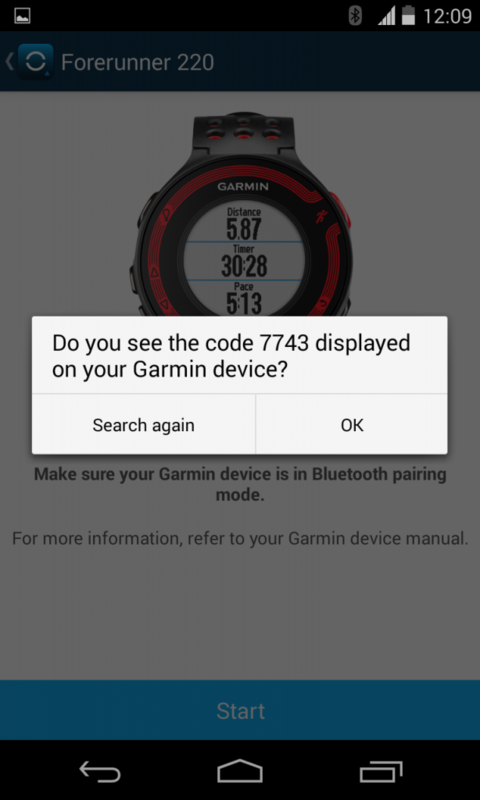 Despite this, I am unable to pair my Garmin 220 with my newly acquired Sony Xperia Z – I get the following message: “Your Garmin device uses Bluetooth Smart technology to sync data to mobile devices. Unfortunately, your Android device is not compatible”. Do you have any suggestions? I haven’t personally tested the Xperia Z with a Garmin but in theory it should work. I’ve read Sony are rolling out Android KitKat (4.4) to their Z products within the next month. This may help to resolve the issue. Let me know if you still have difficulties and I can remove it from the post as unreliable. Sorry for the lengthy delay in responding. After upgrading the system software on my Xperia Z, I am now able to pair and connect successfully with the Garmin 220. The only problem is that I am now getting a message ‘failed to sync’ . No matter how many times I try, I still get this message. I suspect that it may be a Garmin issue rather than a problem with the Sony, but I could be wrong. I just got my 220 and although it will connect to my HTC One S fine, I too am getting the “failed to sync” message repeatedly. Did you find a solution? I have a note 3 and am also getting the failed to sync message. After waiting 7 months for an android app that is compatible with my phone, this is really disappointing. Syncing fails everytime. It says connected, then like it’s going to sync. Only to say sync failed everytime. Super bummed. Success at last! I updated the software on my Garmin 220 and bingo! 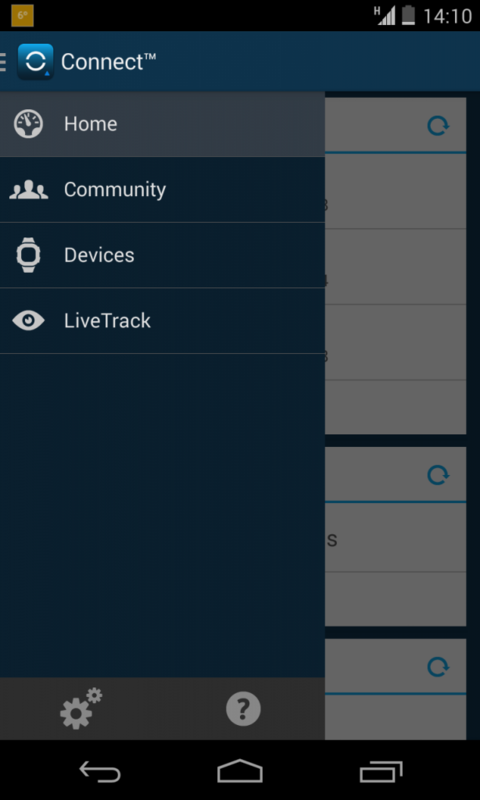 I can now sync and upload activities. Hello, with a moto G and a 220, ir Worked for me one time, even uploaded a Run. But now there is a new run in the wach But it is not uploaded in the sinc process. I have reinstalled the app 2 times and linked the watch severas times, But the New Run is never uploaded. trying to sync my 620 with the android phone – after pairing it connects hangs for about 30 seconds and disconnects – a fail …. My FR 620 and Samsung Galaxy S III (Android 4.3) can easily pair. But when it tries to syncronise it takes forever, and the latest activity is never transfered, and after a while > 30 minutes i lose my patience and abort the transfer. It is only the latest activity that has to be transferred as I transfer via WiFi when I get home. But all the times that I have tried to transfer an activity OTF (On The Fly) it fails. I having same problem for my note 3 . Both found each other with id number but not syncro at a all. Tried several still no good. What next? Really disappointed. Does the Garmin Connect works for Forerunner 910xt? For a model like the 910xt, it can’t directly upload your workout data through a mobile phone. You have to use a computer by plugging in via USB or by the ANT+ stick which should come in the box. Though you have to upload your data through a computer, you should still be able to download Garmin Connect onto your phone to take a look at your uploaded performances. Once your data is uploaded onto Garmin Connect through your computer, you could still download the app onto your phone to review performances. Thanks! this worked for me. Appreciate your taking the time to leave that comment. Hi, I am trying to pair an iphone 5s to a forerunner 220. I am getting to the point where i get a passkey etc. and then it prepares to sync but i end up with a Device not found. even though i get the linked passkey. can you help??? Hey, sorry for only just reading this, do you still need help with pairing these devices up? First step would be to check both the iPhone and Forerunner have the latest software installed, let me know if you need help with this. Hi. I have a new Forerunner 25. I have paired the device with my Samsung using the Connect app. I went for my first run with the watch this afternoon. The phone says sync complete but no data is available on the app. How do I download the data onto my phone? Sounds a little unusual, so may need to test if the data has fully uploaded. If you go to https://connect.garmin.com/modern/activities and log in, does your run appear under the activities menu?